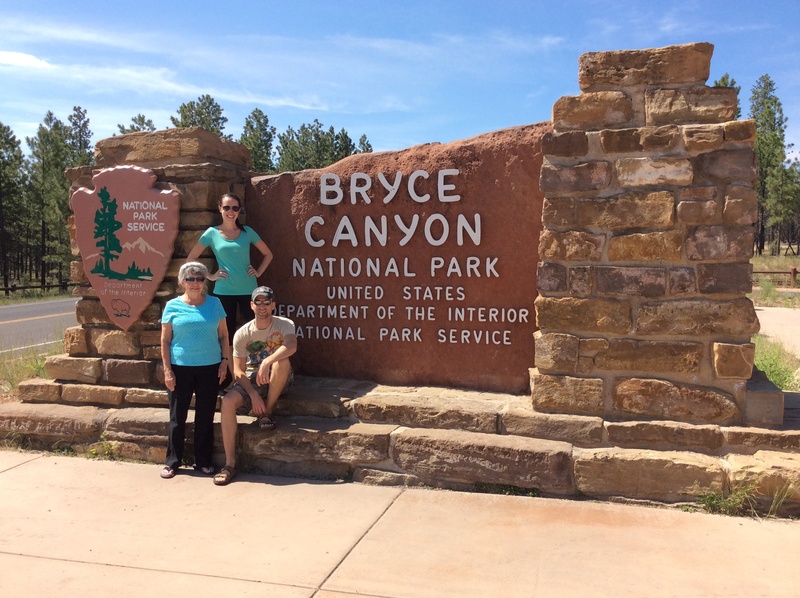 We left Beaver this morning and decided to go on to Bryce Canyon on our way on to Grand Canyon. Driving along Highway 12, we were amazed at the red rock formations in the aptly named Red Canyon. Highway 12 has been named an “All American Road,” the highest designation in the national highway system, and we could see why–every angle showed another beautiful sight. We made our way into the park and stopped at the first overlook, Sunset Point. It was CRAMMED with people, and we couldn’t find a parking spot. I ran out to the view to at least take some pictures to show Grandmother and Tim. I was bowled over with what I saw, so I ran back to the car to tell Tim he at least had to run out. At this point, he had wedged in between two dumpsters, and I sent him out to look. I got behind the wheel, narrowly avoided being ticketed by a ranger, and found a parking spot by luck. I encouraged Grandmother to just walk a little bit to get a view of just one section. Grandmother almost stayed in the car, but she said she made herself get out, and it was totally worth the walk she declared. “After all I’ve seen, it still kind of boggles my mind,” Grandmother said. She kept saying she was looking at the sights, but she couldn’t convince herself that it was real. It was pretty out of this world! This location had not previously been on any of our bucket lists, but we decided it should have been! The word for the day today was “Wow.” We probably said that word more than any other today. 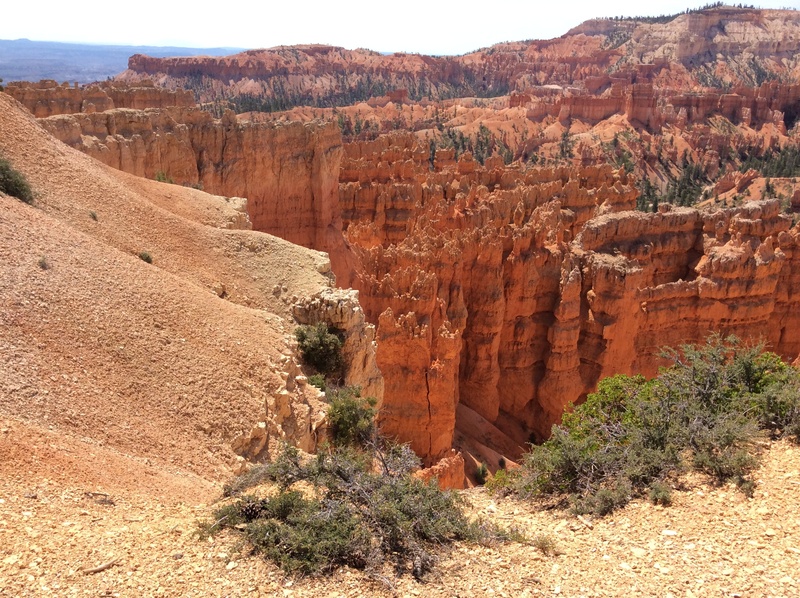 The sights in Bryce Canyon were breathtaking. Even though we barely saw anything in the park, I felt like I had seen so much. The mind can’t really comprehend the vastness and the beauty! After our brief detour into Bryce Canyon, we were officially on the road to Grand Canyon… and it was on this road that the wandering began… After we crossed into Arizona, a sign warned that the road ahead was closed. However, a road closure couldn’t be seen, so we thought perhaps the sign just hadn’t been taken down. So, we merrily clipped along the road, marveling at the sights and listening to our book. And then… twenty miles from the sign that had announced a road closure, the road closed. Abruptly. No detours, no side roads… which left us with just one option: back track and reroute. As soon as we turned around, the GPS immediately added two hours to our trip. Grandmother put a positive spin on it, and we decided we would still get into Tusayan at a decent time. And then… we hit traffic. The road was down to one lane, and they were not letting traffic through very often, so we sat absolutely still for half an hour. Thankfully we had just stopped for gas and a bathroom break. Once we got through the traffic, we came to a fork in the road. The GPS was saying left, but the sign said Grand Canyon was to the right. Not being familiar with the area, we trusted the GPS. BIG MISTAKE. 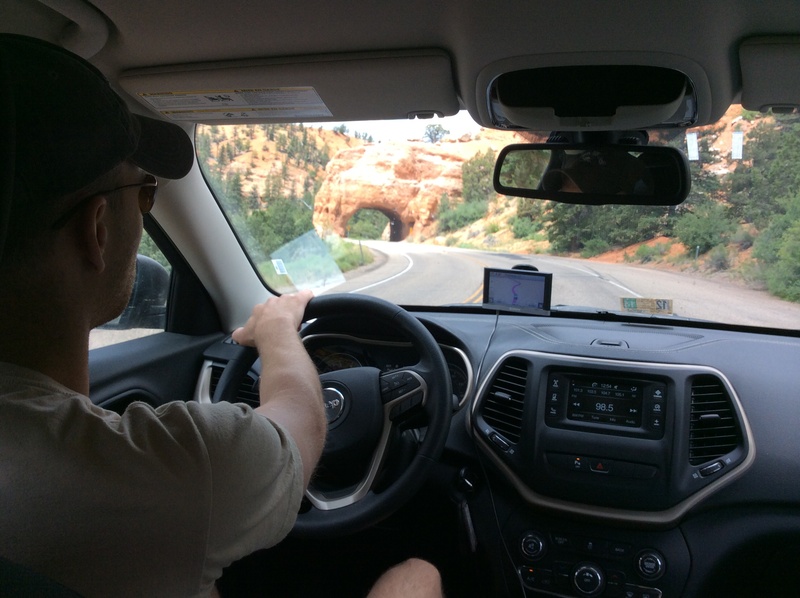 We ended up having a repeat of our experience earlier in the day–we drove twenty miles through Navaho Nation only to find that the GPS was asking us to do a u-turn to retrace those twenty miles and take the turn that had initially given us a pause. Totally inexplicable! 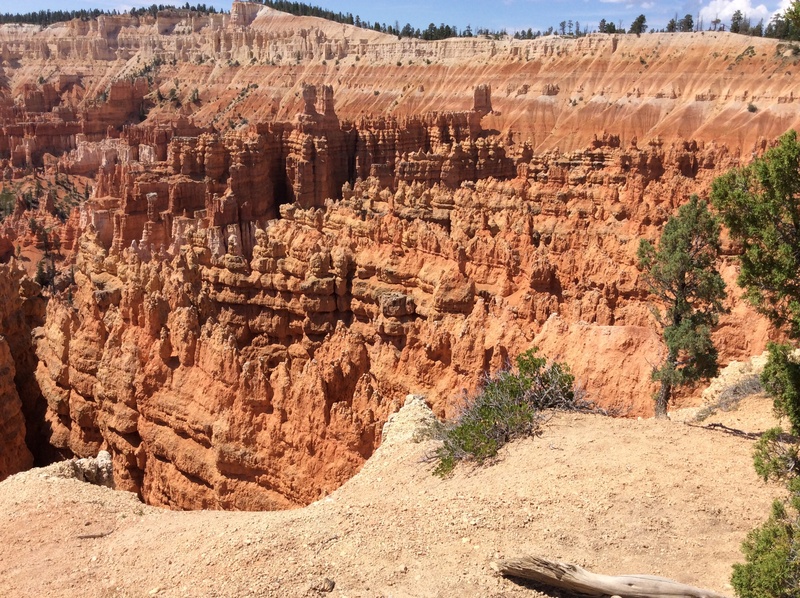 In all, our trip took us almost exactly twice as long as it should have (granted, our stop in Bryce Canyon added two hours to the trip). We traveled for hundreds of miles without seeing signs of life today and were fortunate not to run out of gas (or have a bathroom emergency!). 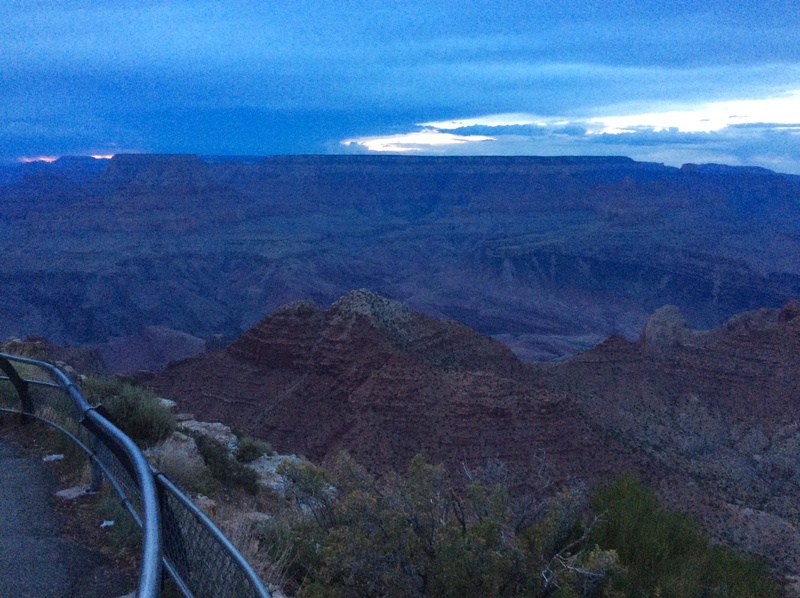 When we finally reached the Grand Canyon National Park sign, the light was fading. We did pull over for a first glimpse of the canyon at twilight. Oh my! What a sight! My eagerness for the morning has greatly increased–I can’t wait to see it all in better light (though I dread the crowds I’ve read we’ll encounter). Because we got in so late, we were rewarded by an animal sighting in the park: two mama elks crossed the road in front of us with their little babies. We’re gratefully off the road at The Red Feather Inn and cozied up for the night after quite an eventful day! Our plan tomorrow is to hit the IMAX show we missed because of our late arrival, and then spend the day exploring the canyon.